Quantum-FFF theory based description for the recent LHC results for Di-Photon, ZZ and WW decay signals. What if we have to deal with a massless Higgs boson? In Quantum Function Follows Form theory, (Q-FFF) shortened "Quantum Form Theory", the Higgs particle is interpreted as a massless transformer particle able to create the universe by transforming its shape after real mechanical collision and able to merge with other shaped particles into composite geometrical knots called Quarks and some Leptons (Muons and Tauons). Singular particles are; the two Leptons: the Electron and Positron, different shaped Photons, Gluons and neutrinos all originated out of one single transformed Higgs. As a result, Q-FFF theory leads to a NON Standard Model of elementary particles, described in this paper. As a consequence the recent Large Hadron Collider (LHC) results, showing special values between 121-130 GeV for the predicted signal of the massive Standard Model (SM) Higgs, should be interpreted as the result of one or more different composite particle decay- and collision processes and not as the result of Higgs decay. In this paper I present some possible transformations after the collision of (Non- SM) Proton particles interpreted as Quark- Gluon cloud collisions, into the observed production and decay results such as, gg into Di-Photons, ZZ into 4 Lepton or WW into LvLv . If by a local energy excess, two Higgs particles collide with enough energy, it is assumed that at fist an Electron and Positron emerges by the mutual transformation of the two Higgs particles. As a result, I found, that many “elementary” particles should not be elementary, but compound constructions or KNOTS made up by transformed Higgs particles. Thus, Muon- and Tau particles are supposed to be “naked” Quarks not protected by a Gluon cloud, but directly bombarded and driven by the Higgs vacuum lattice. As a consequence of this Non Standard Model I will describe some examples of possible collision and decay processes which could be responsible for the recent LHC findings between 121 and 130 GeV. 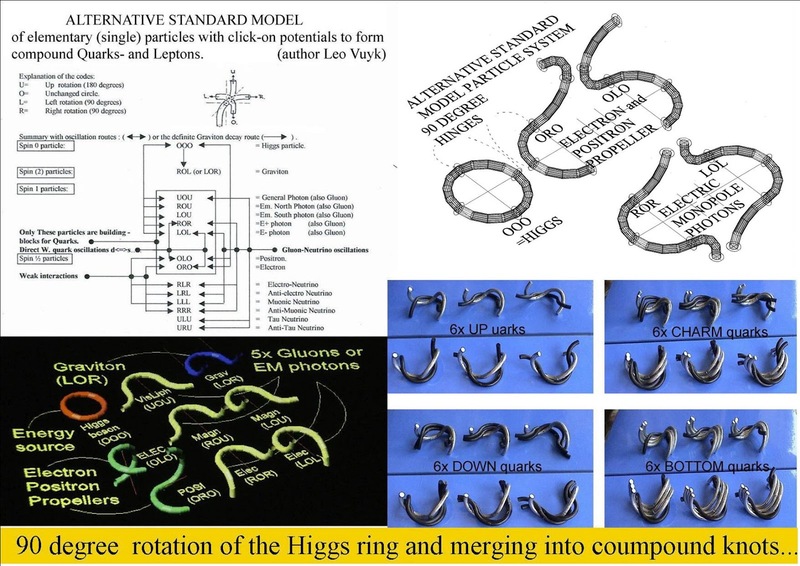 In Q-FFF theory the Non Standard Model (Non SM) Higgs is presented as a massless complex 3-D ring (torus) shape divided in four equal pieces which are connected by three disc-like hinges, which can rotate into only four 90 degree-positions with the possible coding: L,R,Oand U.
I will use terms and codings of the so called alternative Standard Model described later in this letter starting with figure 1. Quantum-Form-Theory based description for the recent LHC results for Di-Photon, ZZ and WW decay signals. However in Q-FFF theory the two Gluons are able to transform directly into two Photons, without the production of a SM Higgs, but by the mechanical aid of four massless oscillating Higgs particles out of the vacuum. 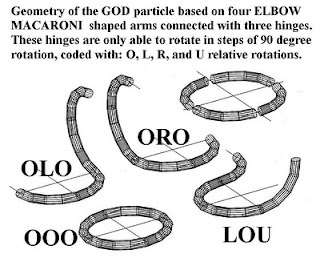 The most obvious Gluons which are assumed to be able to such a direct transformation are the Gluons coded: LOL or ROR, since they have the form and symmetry needed for external dual in tandem oscillating (ring shaped) Higgs particles to transform both “arms” of one Gluon LOL or ROR at the same time and create a “general Photon” used for the range of visible light to gamma rays, coded UOU . Thus we need 4x Higgs bosons not for decay product, but for internal particle change by rotation. 2: The ZZ production by Quark collision and decay into 4x Leptons. 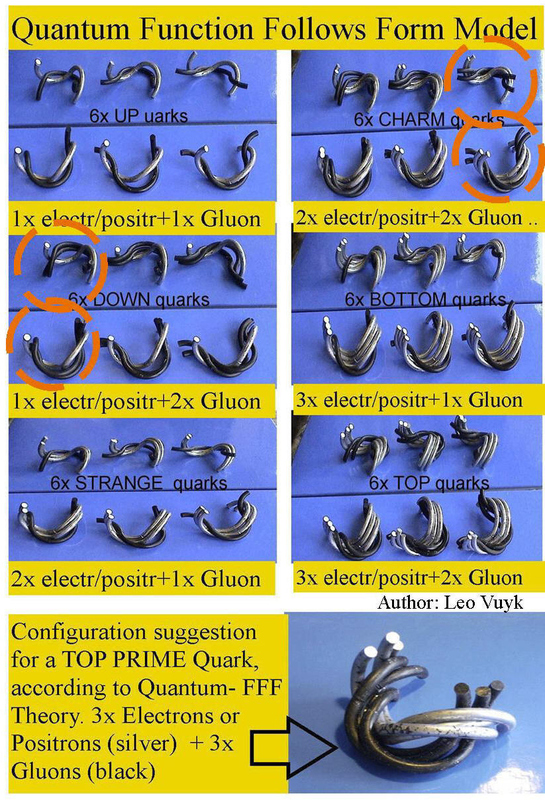 To produce a ZZ combination we need the ingredients (Electron ORO and Positron OLO) of 2x d and 2x u Quarks. A: ZZ decay simply by falling apart into 2x Electrons arbitrarily coded 2x(ORO) and 2x Positrons 2x(OLO). B: ZZ decay into Muons. The Electrons and Positrons released by the ZZ, seem to be also able to attract Gluons out of the Quark Gluon plasma and form Muons. 1x OLO is supposed to transform by addition of two Gluons (ROR) into 1x (OLO+2xROR)= Muon+) see figure 6. 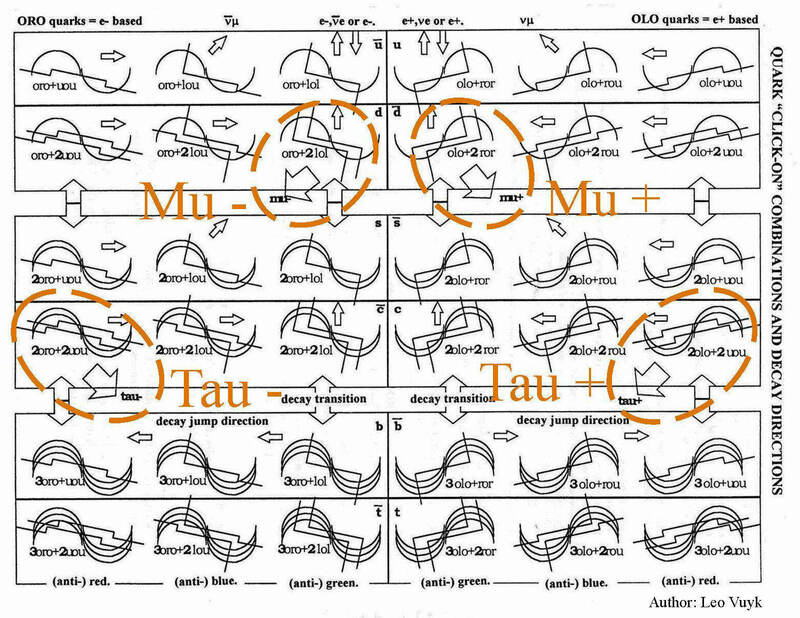 1x ORO is supposed to transform by addition of two Gluons (LOL) into 1x (ORO+2xLOL= Muon-) see figure 6. C: ZZ decay into 4xTauons is not possible (and not observed in the LHC) only by the ingredients of the two ZZ, since each Tau particle needs 2x Electrons or 2xPositrons as a composite base. Consequently, according to Q-FFF theory, there is only room to decay ZZ into 2x Tau Leptons. 3 The WW production by Quark collision and decay into LvLv. 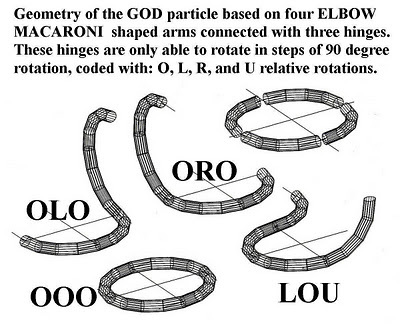 In Q-FFF theory, the W particle is a compound particle of (2xOLO+1xORO=W+) or (2xORO+1xOLO=W-) (See figure 10). To produce a set of W+W+ particles we need the TOTAL Electron and Positron ingredients of only TWO colliding Protons. However, to produce a set of W-W+ particles we need ingredients of THREE colliding Protons or at least and extra Quark, since we need 3x colliding d- Quarks (ORO+2xLOL) and 3x u Quarks (OLO+ROR) out of Proton nuclei. Inside two protons we count 2x duu. As a consequence, we need at least three protons because for the production of W+W- we are short of one d quark, which we have to find somewhere else in a third proton. Thus we count in total: 3xOLO, 3xORO; all the ingredients needed for the W+W- combination. According to Q-FFF theory this could be solved, because we get not 2x neutrinos but 4x neutrinos! In Q-FFF theory, a Positron OLO and Electron ORO can be transformed by dual Higgs oscillations into respectively LLL respectively RRR. W+W- (3xOLOand 3x ORO) can also be transferred into 1x OLO Positron and 1x ORO Electron added with 2x LLL and 2x RRR Muonic neutrinos. Thus we count again 4x Neutrinos! 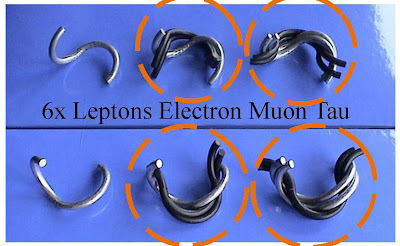 However, to produce Muons we need additional Gluons (2x ROR + 2x LOL) out of the Gluon sea, which merge with the Electron and Positron into Muonic knots. In Q-FFF theory, a Positron OLO and Electron ORO can be transformed by dual Higgs oscillations into respectively LLL or RRR. seems preferable because of the excellent fit to the ρ parameter. The above two options are of course not the same thing. (> 250 GeV) may clarify the issue. But then, who knows what will happen ? Reconciliation of QM with GR and the need for a pulsating entangled CPT symmetric raspberry shaped Multiverse. Reconciliation of Quantum Mechanics (QM) with General Relativity (GR) and the need for a pulsating entangled CPT symmetric raspberry shaped Multiverse. 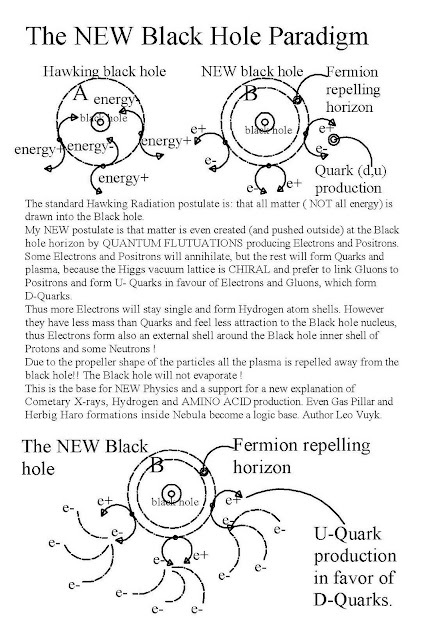 In (Q-FFF) Quantum Function Follows Form theory, the Higgs particle is interpreted as a massless but energetic oscillating transformer particle, equipped with a complex internal structure and able to create the universe by transformation of its shape, after real mechanical collision and merging with other transformed Higgs particles into knots called Quarks and Leptons. The best place to create Higgs particle based plasma out of the “nothingness” of the oscillating super dense Higgs vacuum lattice, seems to be not only direct after the Black hole splitting Big Bang Multiverse, but even more at the event horizon of smaller “new paradigm” black holes proliferated through the multiverse. This multiverse seems to have a raspberry shape equipped with a restricted number of CPT (Charge Parity Time) symmetrical universes as berries or lobes. 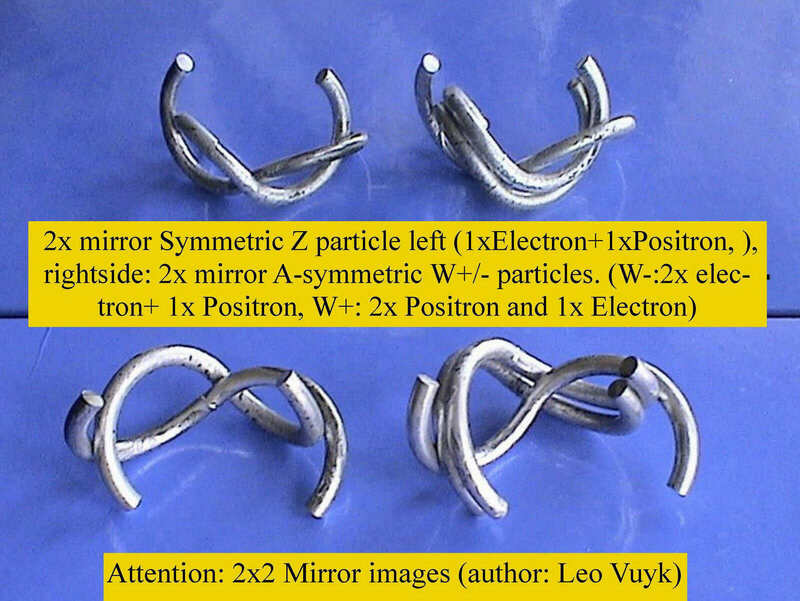 One of these lobes is supposed to be OUR material universe which is supposed to be entangled down to the Planck scale (thus even at the human scale) with at least one opposing anti-material mirror universe of the raspberry. The raspberry multiverse is supposed to be pulsating. 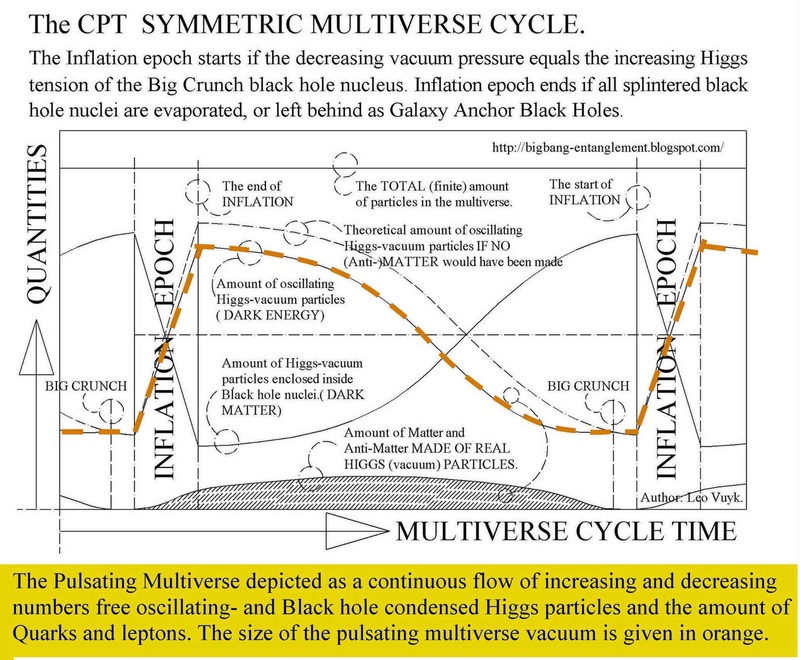 due to the existence of a process of evaporation of the vacuum Higgs vacuum particles (Dark Energy) during the big bang inflation process and in succession, by the consumption of the same Higgs vacuum by individual black holes (Dark Matter) created at all scales from Super Nova black holes down to Sunspots, Comets, Micro Comets and even Ball Lightning. Quantum FFF Theory is an attempt to contribute to the reconciliation of Quantum Mechanics and Relativity, by surpassing the mathematical abstractions and interpret both theories in a more classical way with some non classical extensions. Quantum FFF Theory tries to do so by a new “classical” description and re-interpretation of well known physical phenomena and experiments which form the base of QM and GR extended by extra qualities such as multiverse- and local entanglement, sub-quantum particle structures etcetera. With the introduction of these experiments, I try to give only a small push (being an architect) to restore the relation between CAUSE AND EFFECT in Physics. I only try to imagine how the quality of things could be shaped or constructed at different scales. The quantities and related mathematics is not inside my field of focus. For 100 years now, both mainstream theories have offered us irrational solutions in Physics, based on statistics of Quantum phenomena and the ideas that the light speed, time and mass, are able to do magical things at all scales without the need for a logical base. “Less Is More” and “Form Follows Function”. The Aphorisms: “Less Is More” and “Form Follows Function”, of Modern architecture, introduced by Mies van der Rohe respectively Louis Sullivan, seem to be REVERSIBLE in Nature. Why, because at the Planck scale, the SHAPE of particles and the way particles are connected to each other and form compound quarks, seem to be the origin of the particle FUNCTION. As a result we may say: FUNCTION FOLLOWS FORM in particle physics. 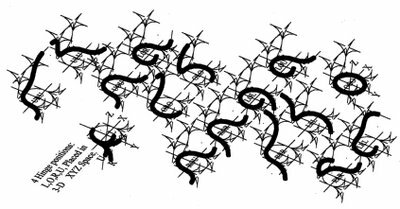 entangled copy Universes, forming a Multiverse with Raspberry geometry, seems the most logical solution for a theory of everything. As a consequences, we should not be afraid for Ockham’s razor who ordered to keep it simple as possible at the Planck- or Universal scale. In fact this Quantum FFF theory follows Ockham’s razor by keeping the choice system in nature simple. If we have a system of entangled symmetric copy universes, then I expect that by a sort of entanglement floatation by chance, one of the copy observers is the first to suggest a specific choice (and become the subject) about 300 m.sec later (B.Libet Ref. [6), the other observers in different (anti-) copy-universes are able to pass or veto the choice. According to mainstream physics, the universe is expanding. The expansion seems to be even accelerating for more distant galaxies. The Hubble redshift observed on Super Nova standard candles seems to be the origin of this misconception. However, if we take the features of Quantum FFF theory into account, then only one solution seems to be possible: Our raspberry CPT symmetric multiverse must have a pulsating character. If the vacuum is described as a super dense oscillating Higgs lattice at the Planck scale (representing dark energy) and proliferated black holes (representing dark matter) have Higgs compressed nuclei constantly eating the vacuum, growing in numbers and size by Supernova explosions, then only one conclusion is to make: the universe is contracting into a Big Crunch black hole. What could be the origin of the universal Hubble redshift including the acceleration effect? The most logical origin seems to be that dark matter black holes located between the light sources and our telescopes influences the structure (the Planck length) of the vacuum lattice by the continuous absorption of the vacuum by these dark matter black holes. Conclusion: The multiverse is pulsating. The Big Bang is based on the splitting and evaporation process of an exploding Big Bang Black Hole (BBBH) created by a so coined Big Crunch Black Hole (BCBH). See figure 1. 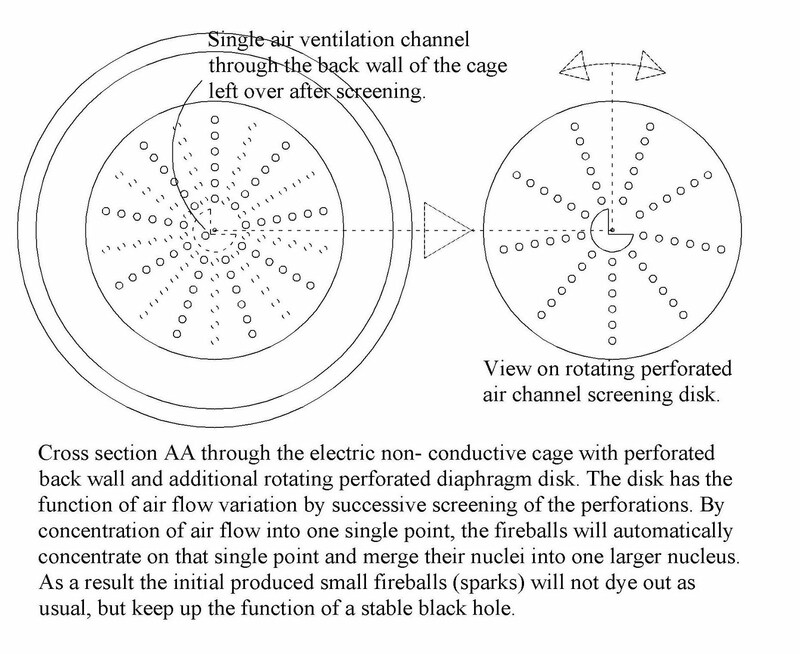 For the nucleus of a microscopic “Q-FFF black hole” see figure 2. Figure 1. The BCBH is able to explode again if the oscillating Higgs Vacuum pressure on the BCBH nucleus, decreases by BCBH absorption and equalises to the internal BCBH nuclear energy or Higgs tonus. 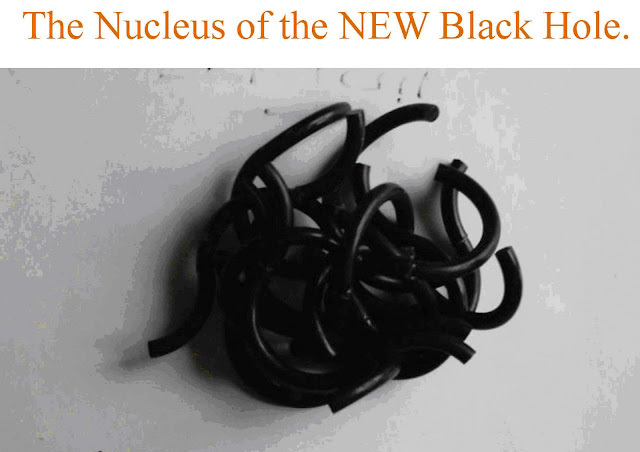 Figure 2. the black hole nucleus (Dark matter) A ball of Higgs particles compressed and condensed by the oscillating Higgs vacuum energy (dark energy). viXra:1102.0052 submitted on 27 Feb 2011. Construction Principles for Chiral "atoms of Spacetime Geometry". viXra:1102.0054 submitted on 27 Feb 2011. Atomic Nuclear Geometry Based on Magic Number Logic. viXra:1102.0056 submitted on 28 Feb 2011.
 viXra:1103.0002 replaced on 14 Nov 2011. 3-Dimensional String Based Alternative Particle Model. viXra:1103.0011 submitted on 3 Mar 2011. An Alternative Black Hole, Provided with Entropy Decrease and Plasma Creation. viXra:1103.0015 submitted on 5 Mar 2011. Wavefunction Collapse and Human Choice-Making Inside an Entangled Mirror Symmetrical Multiverse. viXra:1103.0024 replaced on 24 Mar 2011. Quantum Gravity and Electro Magnetic Forces in FFF-Theory. viXra:1103.0068 submitted on 16 Mar 2011. Function Follows Form, at the Quantum Scale and Beyond. viXra:1103.0097 submitted on 23 Mar 2011. 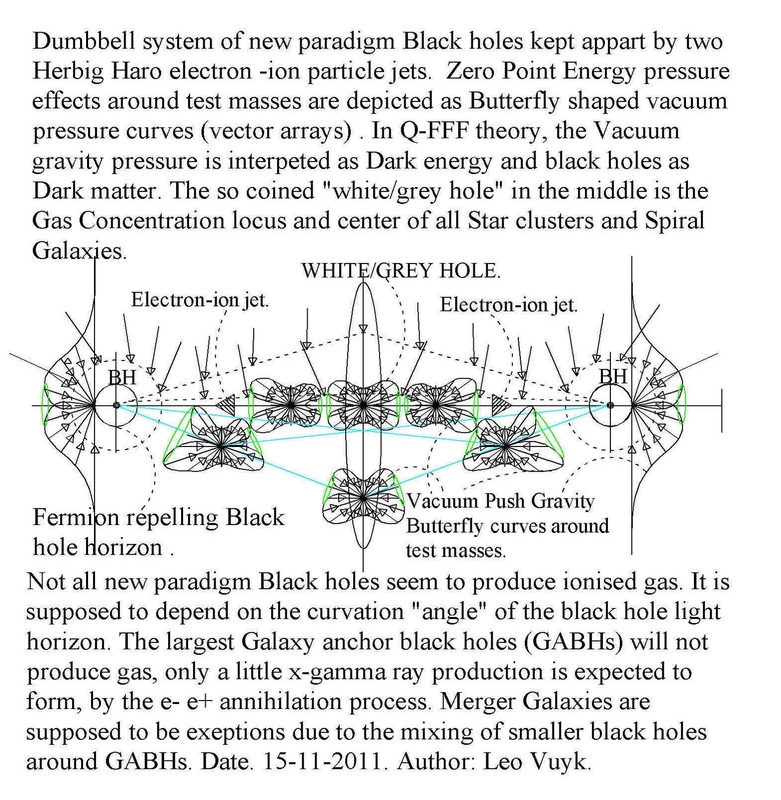 ZPE Zero Point Energy Examples Around Black Holes. viXra:1104.0002 submitted on 1 Apr 2011.
 viXra:1104.0044 submitted on 13 Apr 2011.
 viXra:1104.0083 submitted on 28 Apr 2011. 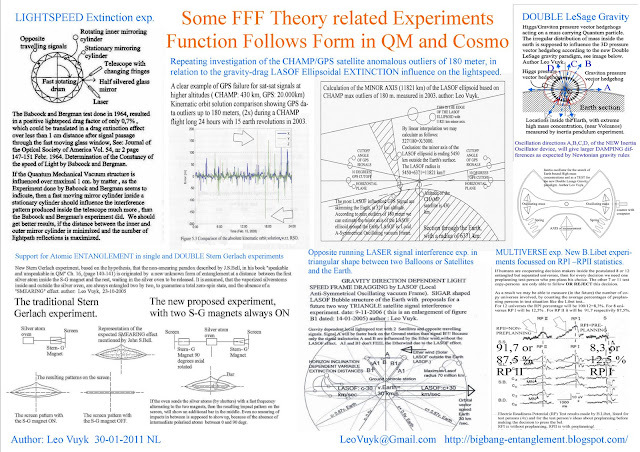 Quantum FFF Theory in Posters. viXra:1108.0006 submitted on 3 Aug 2011.
 viXra:1108.0036 replaced on 21 Sep 2011. 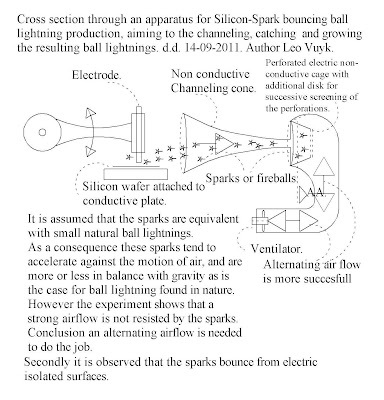 Artificial Ball Lightning Production and Exploitation Device for Zero Point Electric Energy Usage. Black Hole Horizon Curvature Dependent Balance Between Plasma Creation and e-e+ Annihilation in Quantum FFF Theory. 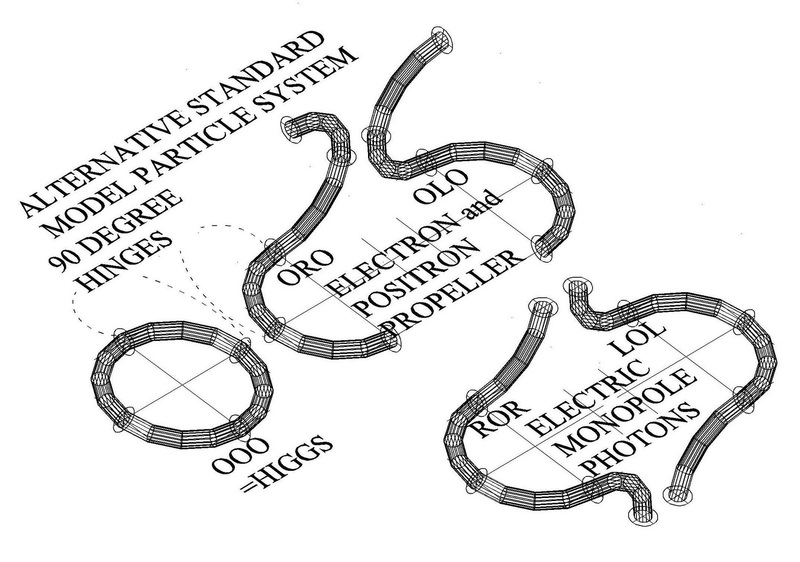 Massless unobservable Higgs, the great TRANSFORMER and Mother of all (Knotty) particles. In particle physics it is an interesting challenge to postulate that the FORM and structure of elementary particles is the origin of different FUNCTIONS of these particles. In this paper we present a possible solution based on complex 3-D ring shaped particles, which are equipped with three point like hinges and one splitting point, all four points divided equally over the ring surface. 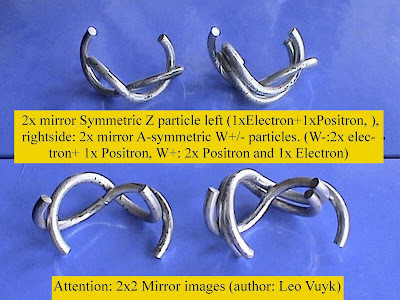 The 3-D ring itself is postulated to represent the “Virgin Mother” of all other particles and is coined Higgs particle, supplied with the 3-hinges coded (OOO), which gives the particle the opportunity to transform after some sort of mechanical collision with other particles into a different shape, with a different function. Thus in this Quantum Function Follows Form theory, (Q-FFF Theory) the Higgs is interpreted as a massless transformer particle able to create the universe by transform its shape after real mechanical collision and merge with other shaped particles into complex and compound knots. It is assumed that the vacuum is seeded with massive numbers of massless unobservable Higgs particles, all energetic oscillating inside a chiral vacuum lattice system and as such the origin and bearer of all energy in the universe. If by a local energy excess, two massless Higgs particles collide with enough energy, it is assumed that at fist an electron and positron emerges by the transformation of the two Higgs particles. Due to the propeller shape of the Fermions, these Fermions start to spin by a constant collision and scattering process with the Higgs vacuum, changing Higgs particles continuously into different forms of Photon/Gluons. As a result, we found, that many “elementary” particles should not be elementary, but compound constructions or KNOTS of transformed Higgs particles. 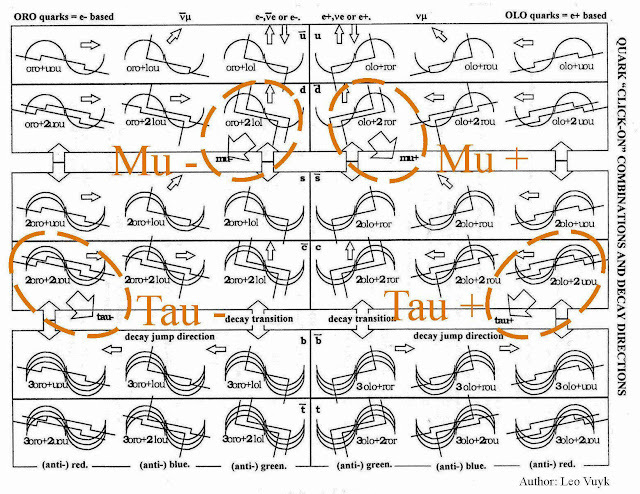 Thus, Muon- and Tau particles seem to be naked Quarks! The start of a micro black hole or ball lightning/fireball by magnetic interference (3x merged magnetic photons, see this)? How is the mainstream struggeling with this subject? What ideas do they dream up? see some examples below. BV-BRST formalism, gnarly problems in physics, brane, conformal field theory, AQFT, quantum field theory, FQFT, smooth Lorentzian space, physicscontents, topological T-duality, T-duality, AKSZ sigma-model, sigma-model, GUT, string theory, Northwestern TFT Conference 2009, higher category theory and physics, string field theory, path integral, Quantization as a Kan Extension, Dijkgraaf-Witten theory, 2009 May changes, orientifold, Green-Schwarz mechanism, FFRS-formalism, topological quantum field theory, quantum anomaly, QFT with defects, 2009 July changes, gauge theory, electromagnetism, electromagnetic field, Kalb-Ramond field, electric charge, magnetic charge, field strength, Yang-Mills theory, Yang-Mills field, integrable system, quantization, geometric quantization, BPS state, extended topological quantum field theory, classical physics, classical mechanics, D'Auria-Fre formulation of supergravity, supergravity, classical field theory, Supergravity and Superstrings - A Geometric Perspective, Poisson sigma-model, quantum mechanics, action functional, supersymmetry, Lagrangian, Euler-Lagrange equation, Jordan algebra, Chern-Simons theory, quantum harmonic oscillator, perturbation theory, renormalization, Hamiltonian, gravity, gravity as a BF theory, first-order formulation of gravity, Plebanski formulation of gravity, landscape of string theory vacua, Hamiltonian mechanics, multisymplectic geometry, classical limit, thermodynamics, dilaton, Bell's theorem, Birkhoff-von Neumann theorem, Dyson formula, gauge fixing, target space, S-duality, net of C-star-systems, applications of (higher) category theory, conformal net, infinity-Chern-Simons theory - contents, Haag-Kastler axioms, Topological Quantum Field Theories from Compact Lie Groups, entanglement, Wightman axioms, quantum operation, modular theory, supersymmetric quantum mechanics, Bisognano-Wichmann theorem, topological Yang-Mills theory, density matrix, quantum information, hermitian matrix, Maslov index, Wick rotation, Osterwalder-Schrader theorem, superselection theory, finite quantum mechanics in terms of dagger-compact categories, Geometric and topological structures related to M-branes, Stokes phenomenon, optics, deformation quantization, extremal quantum channel, graphical quantum channel, quantum state, Kerr spacetime, closed time-like curve, standard model of particle physics, observable, phase space, mathematical physics, transgression, The Dirac Electron, variational calculus, DHR category, Gleason's theorem, books and reviews in mathematical physics, special relativity, Kochen-Specker theorem, spin-statistics theorem, perturbative quantum field theory, Reeh-Schlieder theorem, general relativity, 2d TQFT, A-model, B-model, state, Fell's theorem, no-go theorem, black hole, fermion, boson, gauge group, Dirac charge quantization and generalized differential cohomology, conserved current, AdS-CFT, Courant sigma-model, Bekenstein-Hawking entropy, generalized second law of thermodynamics, phenomenology, Wess-Zumino-Witten model, Schwarzschild spacetime, 11-dimensional supergravity, kilogram, dual heterotic string theory, variational bicomplex, Calabi-Yau object, parallel transport, quantum gravity, Einstein-Hilbert action, Avogadro constant, loop groupoid, Kaluza-Klein mechanism, Chern-Simons element, gauge transformation, gravitino, graviton, BF-theory, cosmological constant, SCFT, electric-magnetic duality, quantization via the A-model, holographic principle, Mathematical Theory of Quantum Fields, quantum electrodynamics, relativistic particle, Green-Schwarz action functional, Stone-von Neumann theorem, mechanical system, Yetter model, superparticle, Landau-Ginzburg model, second quantization, heterotic string theory, kinematics and dynamics, S-matrix, Vladimir Turaev, Chern-Simons gravity, Haag's theorem, causal locality, string, sewing constraint, photon, time slice axiom, charge, picture of mechanics, path integral as a pull-push transform, Noether's theorem, reductions deformations resolutions in physics, spinning particle, Peierls bracket, Mathematical Topics Between Classical and Quantum Mechanics, Renormalization and Effective Field Theory, configuration space, effective quantum field theory, Quantization of Gauge Systems, Noether identities, gaugino, Bohr topos, Gruppenpest, gluon, gauge boson, Three Roles of Quantum Field Theory, fermionic path integral, worldvolume, background gauge field, particle, timelike curve, Lorentz force, Nambu-Goto action, differential T-duality, Einstein equation, fundamental particle, superstring, Fermi theory of beta decay, Quantum Fields and Strings, second law of thermodynamics, Cauchy surface, self-dual higher gauge theory, what to contribute, mechanics, QCD, Dirac interaction picture, classical state, Jordan-Lie-Banach algebra, Local Quantum Physics -- Fields, Particles, Algebras, spinning string, supersymmetry and Calabi-Yau manifolds, spontaneously broken symmetry, sigma-model -- exposition of classical sigma-models, sigma-model -- exposition of higher gauge theories as sigma-models, sigma-model -- exposition of quantum sigma-models, sigma-model -- exposition of a general abstract formulation, sigma-model -- exposition of second quantization of sigma-models, 4-dimensional supergravity, black brane, higher dimensional Chern-Simons theory, c-theorem, contents of contents, hole argument, Kapustin-Witten TQFT, instanton, 3-dimensional supergravity, Yang-Mills instanton, moment of inertia, Characteristic forms and geometric invariants, Yang-Mills instanton Floer homology, vacuum, 6d (2,0)-supersymmetric QFT, universality class, Geometric Algebra, rigid body dynamics, angular momentum, angular velocity, Euler-Arnold equation, Foundations of Mechanics, Hamiltonian dynamics on Lie groups, 3d quantum gravity, symplectic infinity-groupoid, geometric quantization of symplectic groupoids, ABJM theory, Seiberg duality, effective action functional, collective field theory, false vacuum, flux, higher spin gauge theory, super Yang-Mills theory, 7-dimensional supergravity, N=4 D=4 super Yang-Mills theory, gauged supergravity, higher gauge field, physics resources, higher dimensional WZW model, 1-dimensional Chern-Simons theory, 4d WZW model, quantum lattice system, minimal coupling, Kirchhoff's laws, Born-Oppenheimer approximation, on-shell recursion, p-adic physics, quantum observable, coset WZW model, 1d WZW model, quantum hadrodynamics, braid group statistics, higher electric background charge coupling, M-theory on G2-manifolds, infinite-dimensional Chern-Simons theory, observable universe, N=2 D=4 super Yang-Mills theory, N=4 D=3 super Yang-Mills theory, teleparallel gravity, thermodynamic limit, Planck's constant, general covariance, quantum cosmology, technicolor, string phenomenology, Higgs field, The Geometry of Physics - An Introduction, Maxwell's equations, Harmonic oscillator, KLT relations, AGT correspondence, C-star algebraic deformation quantization, Dirac charge quantization, instanton in QCD, G2-MSSM, MSSM, cosmology, scattering amplitude, Turaev-Viro model, standard model of cosmology, open/closed string duality, model (in theoretical physics), particle physics, string theory results applied elsewhere, twistor string theory, quark-gluon plasma, cosmic inflation, Einstein-Maxwell theory, cosmic microwave background radiation, geometric quantization by push-forward, higher gauge transformation, Einstein-Yang-Mills theory, geometry of physics, matter, Liouville integrable system, Levin-Wen model, QFT on non-commutative spacetime, MOND, BPTS-instanton, nuclear force, superposition, Aharonov-Bohm effect, ghost field, duality in physics, electromagnetic potential, continuum mechanics, 5d Chern-Simons theory, self-dual Yang-Mills theory, electromagnetic field strength, geometric quantization. Breaking news as a support for Quantum-FFF theory: 7 october 2011. 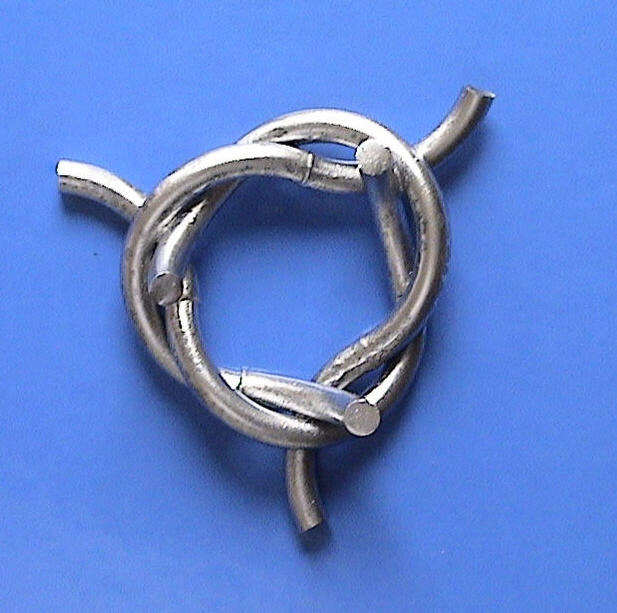 Witten describes knot theory as being able to delve into the deep recesses of mathematical research but also as something that can be explained in “down-to- earth terms that everyone can understand”. Will this action also lead to a convertible Higgs particle without mass as the "mother of all particles"? Function Follows Form (FFF) in Quantum FFF THEORY. 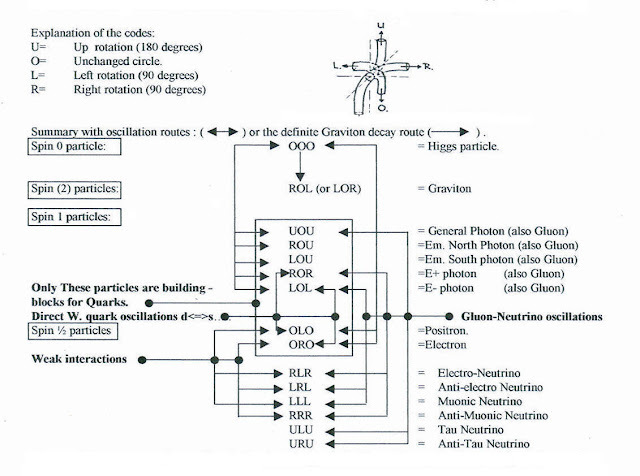 The Form and Microstructure of elementary particles, is supposed to be the origin of Functional differences between massless Higgs- Graviton- Photon/Gluon- and spinning propeller shaped Fermion particles with mass. 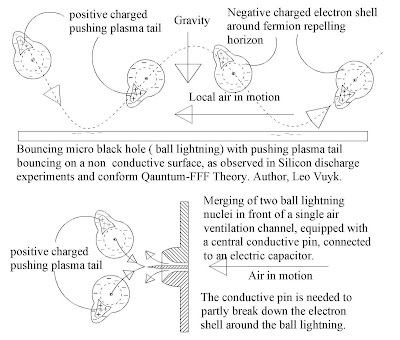 In this letter we describe a possible design for production and exploitation of such ball lightnings, based on experimental experiences with Silicon-discharge fireball examples and our proposal for a new paradigm black hole based ball lightning, as a part of Quantum FFF theory. Quantum Function Follows Form (FFF) theory states, that the vacuum is seeded with fast oscillating massless Higgs particles, oscillating along a complex chiral tetrahedral vacuum lattice, which has the ability to transfer Photon and Graviton FORM information in bunches of oscillations, through the vacuum lattice with the local speed of light. Ref [5,6,8,9]. 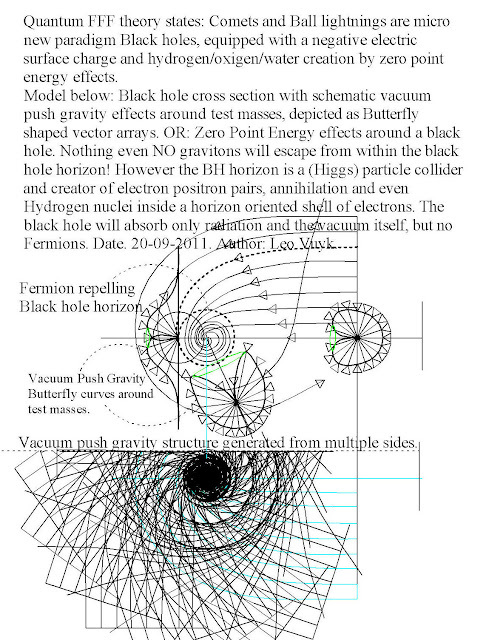 If a New Paradigm Black Hole (NPBH) accelerates through the vacuum lattice (ref 4) it is only supposed to be possible by the anti-symmetric deformation of the vacuum lattice around the (NPBH). 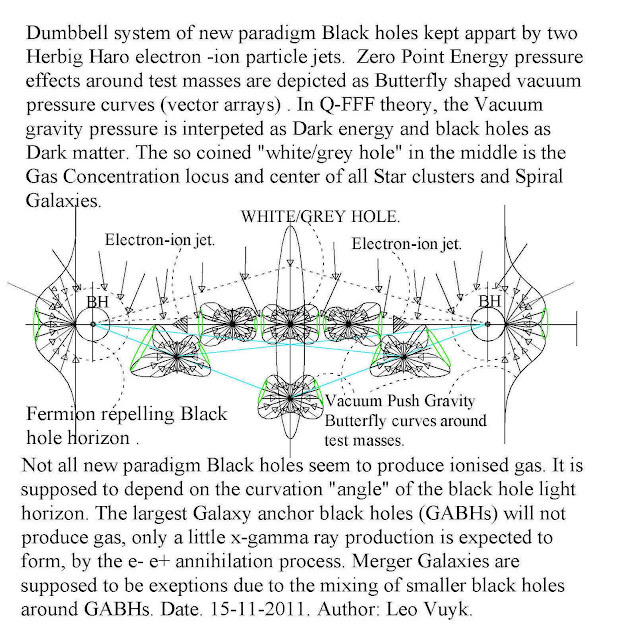 According to Q-FFF theory NPBHs are equipped with a thin but effective Fermion repulsive globular horizon. In a former letter (ref. 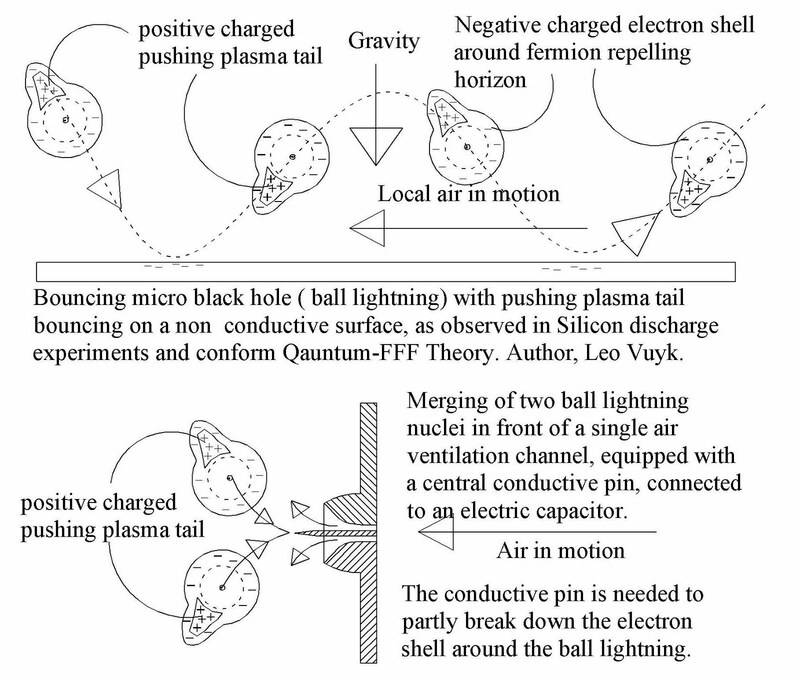 9) we described the possibility of the theoretical solution to harness two micro black holes (ball lightnings) in a container for future Zero Point Energy or free electric energy production. (see ref. 9, figure 15). As a result of the experimental evidence that the bouncing Spark-Fireball production in silicon wafer experiments (ref.16-19) have the same characteristic properties as natural ball lightnings and NPBHs, it is possible to describe the principles of a combined device of artificial ball lightning production and exploitation for Zero Point Electric Energy usage, see next figures 1-6. 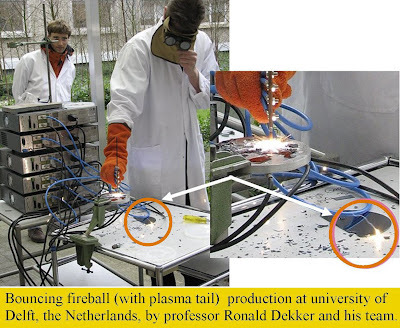 Figure 1, Production and gathering principle for Silicon discharge Spark-Fireballs. Figure 2, Example of a perforated wall with variable air transmission. Figure 3, Principle of Bouncing Spark Fireballs with principle for merging small fireballs. 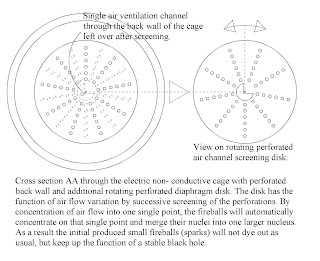 Figure 4, Cross section through a principle apparatus for exploitation of ball lightnings as an electron pump or ZPE Zero Point Energy production around two micro-black holes. See also figure 6. So called Hanny's voorwerp seems to be powered by Monster Black Holes located far aside from the Galaxy!! Ionised Oxygen is found to be the result of these Monster (Giant) black holes. 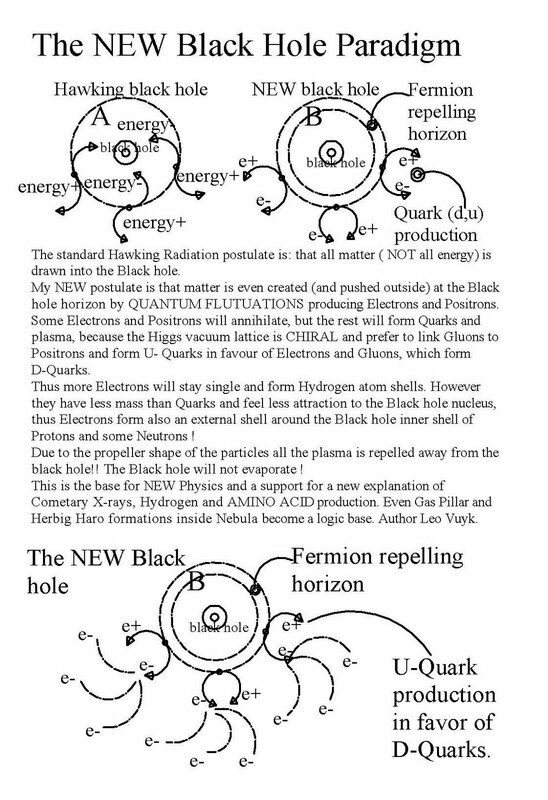 Indeed see below how ionised atoms can be the result of my new Black Hole paradigm and Big Bang pardigm assuming that the big bang was the splitting of the largest of all monster black holes. 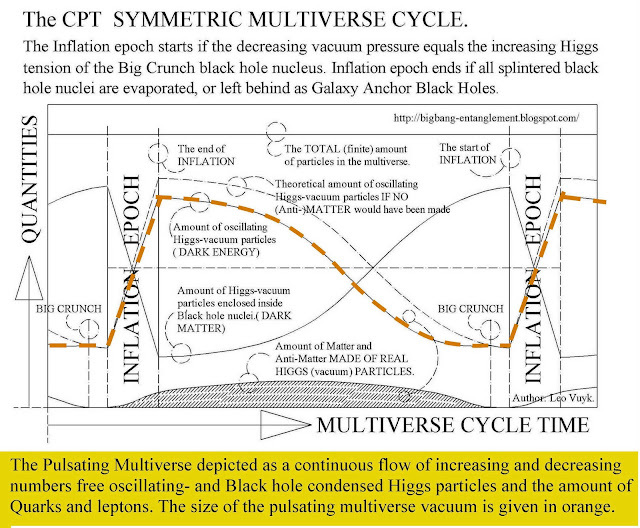 “An Alternative Black Hole, Provided with Entropy Decrease and Plasma creation”. However larger sized black holes produce less gass and less plasma!! due to the Horizon angle curvature decrease of larger black holes. see also figure 9. 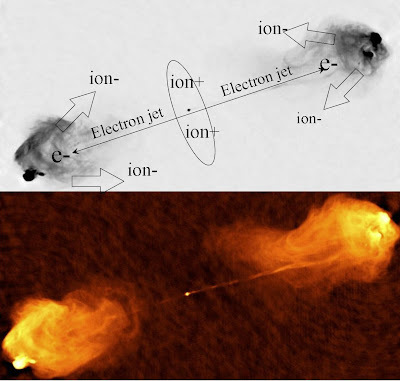 Figure 9, The principle of gas formation and electron jet creation between two new paradigm black holes. Figure 8, Photo made by the R.Dekker team of the silicon wafer fireball experiment. 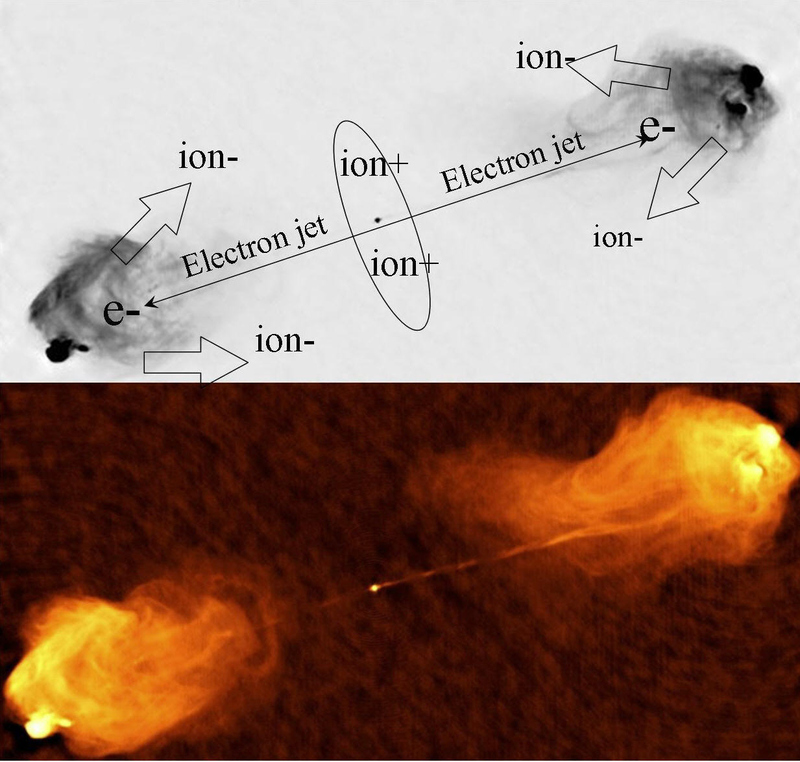 Splitting Micro Black Holes, the origin of Lightning Strokes and Megacryometeors? Book: “The New God Particle and Free Will”. Author: Leo Vuyk, LuLu publishers, 2008. Author: Leo Vuyk, LuLu publishers, 2011. Newscientist Lightningballs created in the lab. 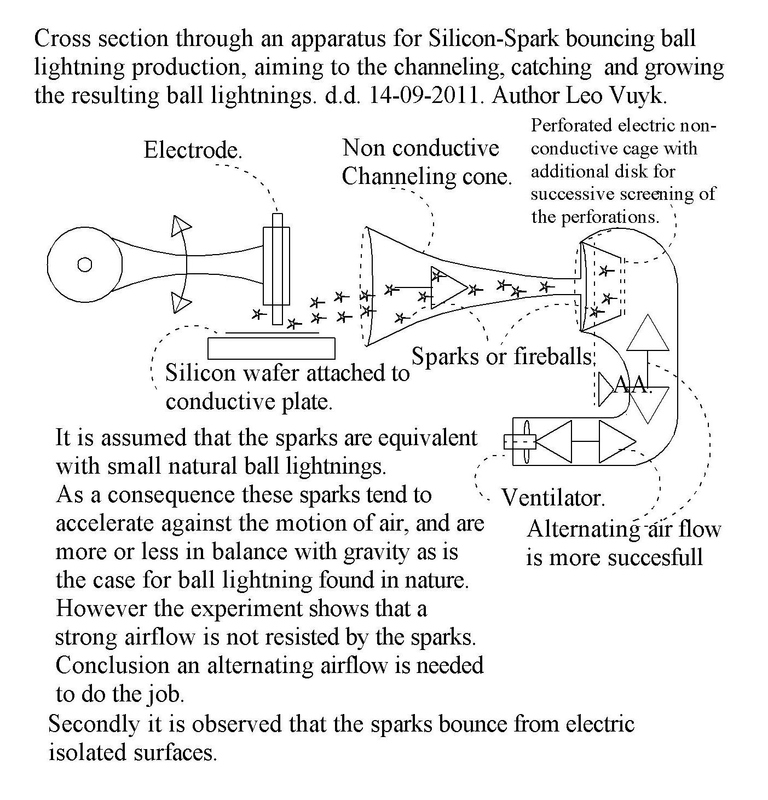 Artificial Ball Lightning produced in the laboratory !? M. Goossens, P. de Graaf, R. Dekker. Cygnus A is the ultimate astronomical electron pump and a great example.